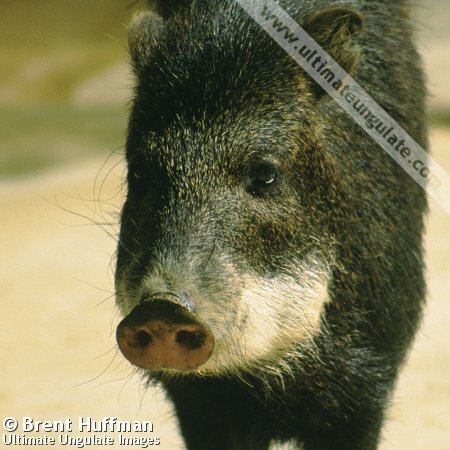 White-lipped peccaries are dark brown or blackish in color. 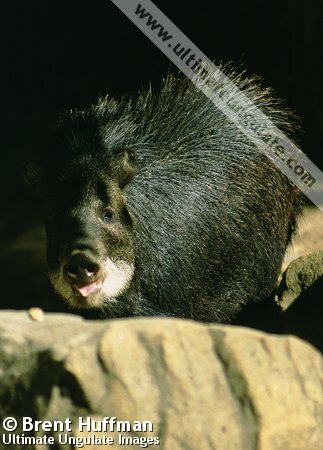 The coat is bristly, with the hairs running down the spine growing longer than the sides and forming an crest which is raised when the peccary becomes excited. The body is rounded and barrel-like, and the legs are long and slender. The face is long and ends with a pig-like nasal disc. Like the rest of the body, the head is dark brown, which makes the white markings surrounding the mouth and lower jaw stand out conspicuously. 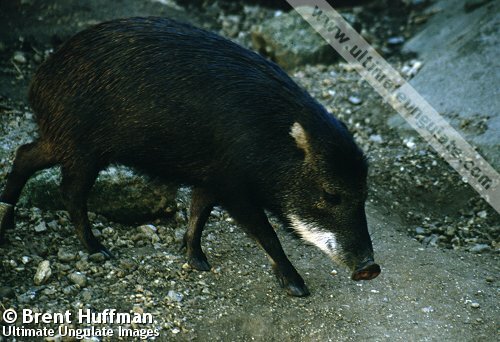 The collared peccary (Tajacu pecari) and Chacoan peccary (Catagonus wagneri) are both found in regions occupied by white-lipped peccaries, but both species are grizzled grey in color, with a light "collar" around the neck and no white lip markings. Litter size: 2, sometimes 1 or 3. Sexual maturity: Between 1 and 2 years of age. Mating times are highly variable depending on location (and food availability), but most peccaries in most regions appear to have a breeding season. Babies weigh just over 1kg at birth, and are reddish brown in color with a darker strip along the spine. Juveniles turn a lighter brown before darkening to the adult coloration after one year of age. 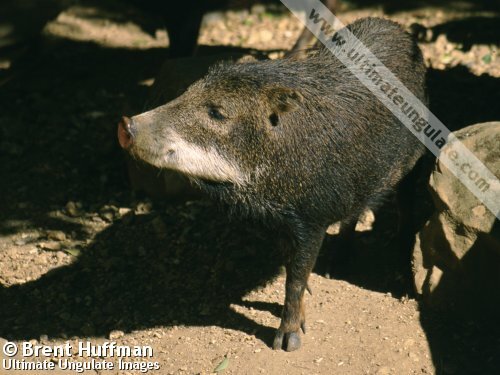 White-lipped peccaries are diurnal, but tend to be most active in the early mornings and late afternoons. They live in large herds, and therefore need large home ranges - anywhere from 19 to 200 km2 for a single herd. Herd movements are dictated by the availability of fruit. Large groups may split into several smaller subherds which share the same home range but forage in different areas. A herd may travel 10 km in a day, spending two-thirds of the day either travelling or feeding. 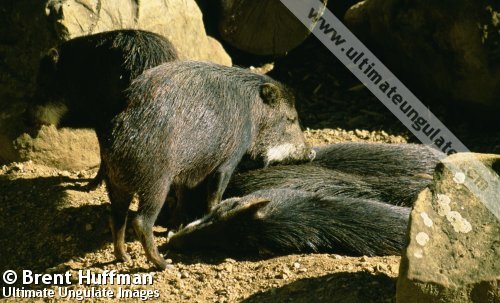 These peccaries have a scent gland on their back which appears to help form a bond amongst members of a herd. White-lipped peccaries are very vocal, making a moaning sound when travelling to keep in contact with others, as well as a bark to raise the alarm. During conflicts, they also clatter their teeth. They can swim well and appear to enjoy wallowing in mud or dust. Family group: Very large herds of 20-300 animals of both sexes. Diet: Fruits, nuts and seeds (especially palm nuts), vegetation, and small amounts of animal matter. Main Predators: Jaguar and puma, potentially boa constrictors. Humid tropical forests, and also drier forests and open savannahs, in Central and South America. The approximate range is depicted in the map below. IUCN Red List: Near-threatened (2009). CITES Listing: Appendix II (2009). Threats: Habitat loss and overhunting by humans.